Intellectual card game for three players. Support for almost any conventions. Distinctive features of the game: sound and music, original saving of the results of games + the history of all games played, the possibility of playing on the network and via the Internet in any ratio of "live" and computer players, scalability of the main window and all child objects, including cards. Worthy intellect of computer players. Having played a cycle of 100 hands, you can send your scores to our server, so that fans of this game around the world can compete among themselves. Availability of Internet radio for listening to 80 radio stations of different countries. Playback of playing cards in three languages, etc. To use all the features of the game, you may need additional DLLs that can be found on the developer's site. Intellectual card game for three players. Support for almost any conventions. 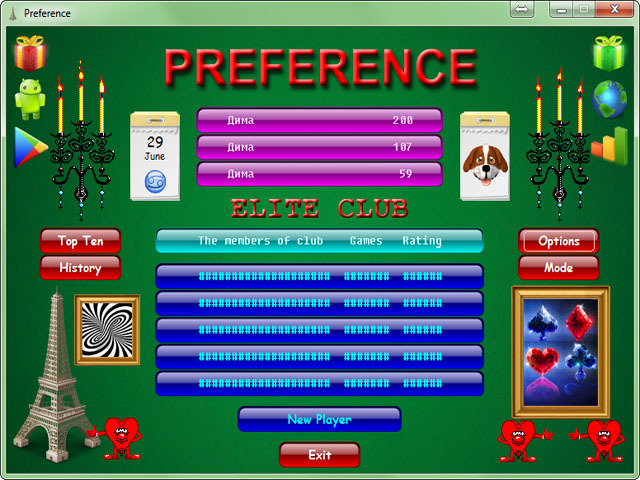 Distinctive features of the game: sound and music, original saving of the results of games + the history of all games played, the possibility of playing on the network and via the Internet in any ratio of "live" and computer players, scalability of the main window and all child objects, including cards. Worthy intellect of computer players. Having played a cycle of 100 hands, you can send your scores to our server, so that fans of this game around the world can compete among themselves. Availability of Internet radio for listening to 80 radio stations of different countries. Playback of playing cards in three languages, etc. To use all the features of the game, you may need additional DLLs that can be found on the developer's site.